The appearance of this frog has evolved to match its surroundings. This is achieved by small pieces of skin which are formed on the edge of the amphibians limbs, thus breaking up the obvious frog outline, and making it difficult to see. This is also accompanied by colours and shapes on its skin that make it quite cryptic. The general colouration is variable - basically brown, reddish-brown or olive with occasional darker patches. Usually have a large patch between their eyes of a dark or russet colour. Found in the rainforest, close to streams and seepages associated with damp mosses and lichens. 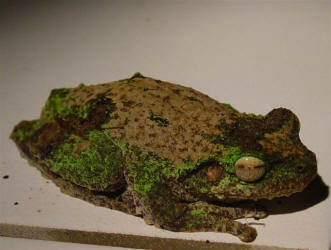 This rainforest frog is a master of camouflage, its colouration designed to look like a lichen covered rock. They can have intricate patterns of different colours including various shades of cream, brown and green, or they can be a plain grey or light brown. Its distinguishing features are the row of pale skin flaps along the arm, looking like a blunt saw blade, and the top half of the eye is a green colour. Males are 36 - 47 mm long, and females 60 - 70 mm. The males call from vegetation and rocks near the edges of rainforest streams. The call is a series of quiet notes, "toc toc toc". Eggs are laid in clumps in still pools, and the tadpoles remain in the gently flowing parts of these streams. Tadpoles can be found year round. They are up to about 3 cm long, and are brown with a dark area on the back where the tail meets the body. The Green-eyed Tree Frog occurs throughout rainforest of the Wet Tropics, from Mt Halifax near Townsville to Big Tableland near Cooktown. They are known to occur at Lake Eacham, Mt Hypipamee and many other national parks on the Tablelands. It has been declared Rare by the Queensland Government. The name refers not so much to green in the eyes, but to a strip of green that is often found on the skin above the eyes; perhaps ‘green eye-browed tree frog’ would be accurate! One of the previous scientific names of the frog was ‘serratta’ due to the serrated nature of the edge of the legs. It is usually found not far away from the smaller rainforest creeks where it gives it's very subtle tapping like call. It may occasionally makes it’s way into lodges and homes within the rainforest.